Gerard Melancon runs Melancon Guitars in Thibodaux, South Louisiana, so it's no wonder this model from his Classic Artist line, is called the "Crawfish". This Cajun custom shop cranks out some spicy Strat & Tele types, including thinline/semi-hollow and chambered options, with only top grade woods & hardware. 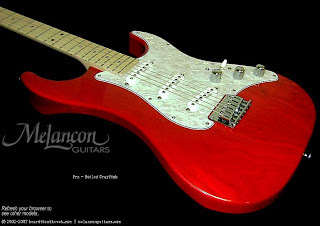 Melancon winds his own single coils & humbuckers, but also offers Duncan P-90's with some models. Refresh your web browser at the Melancon home page to display a new cover model for every refresh. Be sure to do that! In addition to their "Models" link, also check the "Dealer Stock" link. Melancon creates some of the most beautiful natural finish tops I've ever seen, I GUARANTEE!! !